Warning: These sell out quickly. Order now to lock in the current sale price and selection. +Prices may rise $100+ when sales goals are met. Bicycling Magazine: "Motobecane USA�is known for turning out exceptionally light production bikes with great components at reasonable prices." If you have ridden one you know why you want one. If you have ever wanted to try one, this is the best deal on a Shimano equipped 29er bike with Hydraulic Disc Brakes and Suntour W/External Preload and Remote lockout front forks. Get Tubeless tech rims now. Tubeless wheelsets of this caliber with sealed bearings and are sold by themselves are normally around $500 to 800+ So this is an incredible deal: You are getting a complete Shimano 29er with a pro-quality TCS Rim tubeless compatible wheelset. Get amazing technology, now! "Our TCS™ (Tubeless Compatible System) technology is the solution for riders seeking high performance, lightweight and durable mountain bike wheel systems that are easy to install, fun to ride and simple to service..."(Simply add your own TCS Tires and Sealant and)"...Say goodbye to air compressors, tire levers and pinch flats. Say hello to your full riding potential. " Shimano's drivetrain brings with it the legendary quality, durability and performance Shimano is known for, all packaged to meet the ever-evolving demands of today�s riders. The 2017 Fantom29 TRAIL is specified with competition-ready components and has geometry based on the FLY Team XC Race Bike of the Year. Compare this bike directly against any other manufacturers 29er hardtail on the market at up to double the sale price. Their bikes are heavier or not as well equipped. None of those come with $499 WTB TCS Tubeless compatible rims. with long travel Suntour WITH External Preload and Remote lockout. The Fantom29 TRAIL adds to those race winning specs; a Truvativ crank and Sealed bearing BB, CaneCreek Sealed bearing headset, sweet shifting Shimano derailleurs with WTB TCS Tubeless compatible Disc Wheelset and truly powerful Tektro Mineral Oil Hydraulic Disc Brake system. Shimano uses Mineral Oil Hydraulic systems in all their hydraulic disc brakes up to and including their top of the Line stuff! Hydraulic Disc Brakes have been rated by magazine reviews as one of the best - Way better than virtually any mechanical system. Motobecane USA has really dialed in a race-proven geometry into this phenomenal ride. The handling is very responsive and yet stable. Singletrack and switchbacks are all handled with ease. Slow speed and high speed, technical and flat-out hammering, you will go faster because this bike is so darn light and capable. What do these 2017 Fantom29 TRAIL 29er mountain bikes compare to? Compare to most any other 29er MTB from Trek, Specialized or Giant with Hydraulic disc brakes and tapered steerer forks. 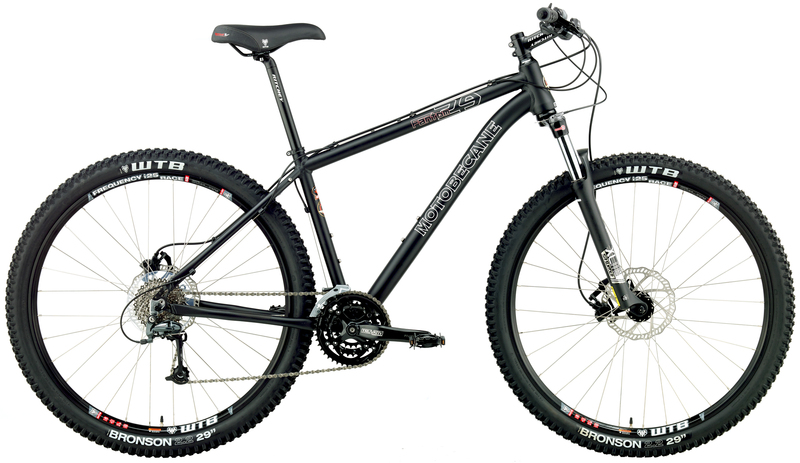 This Motobecane 29er Mountain bikes sells for $100s less. These 2017's are shipping NOW. Get yours before they are all gone! 13" - 5'4" to 5'6"
17.5" - 5'10 to 6'0"
19" - 6'1" to 6'3"
21" - 6'3 to 6'5"
For specific dimensions, please consult the geometry chart. Hubs GRAVITY ALLOY DISC BLK ANOD. FRONT HUB ALLOY BLK QR, 14Gx32H / GRAVITY REAR BLK ANOD. DISC BRAKE HUB ALLOY BLK QR 14Gx32H, 135MM.